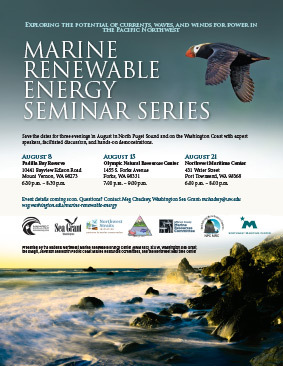 Monday, Aug 21, 2017, 6 – 8 p.m.
Join experts from the University of Washington Northwest National Marine Renewable Energy Center this August for an evening seminar about the ocean’s potential contribution to future energy needs. Learn about the current status of marine energy research, and what forces will shape its development, particularly off the Pacific Northwest coast. Discuss the environmental, social and engineering challenges (and opportunities! ), as well as current research to understand and proactively address these issues.